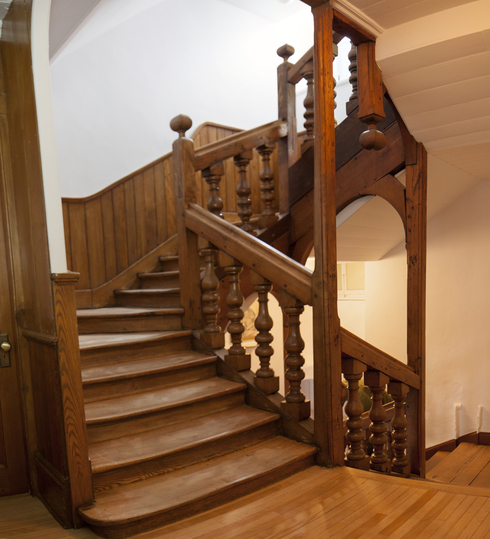 “Saint Augustine Staircase”. Wood. 1689. In our first Monastery, this corridor served as the entryway to the Monastery. The stairway is more than three hundred years old; it was built after the second Monastery fire in 1686. It is made entirely of wood, using tenons and mortises in place of nails. This type of craftsmanship is rarely found elsewhere in Canada. The steps have never been replaced. They are marked and worn from thousands of footsteps over the years. Long ago, a pulley was hung at the top, that the nuns used to pull up foodstuffs to be stored in the attic.